Who's next to post negative export growth? Next week in Asia kicks off with China’s GDP data for the second quarter. This and a slew of trade releases elsewhere in the region will be examined in light of the ensuing global trade war. Indonesia’s central bank has seen no fruits from the 100bp policy rate hikes in supporting the local currency and we don't think it will hike again next week. A tick down in China’s GDP growth in line with the consensus to 6.7% in 2Q from 6.8% in 1Q does not reflect the trade war impact. Not just yet. The trade war was proclaimed by president Trump in April but the execution only started in early July. However, the downside growth risk from damage to investments in the export sectors cannot be fully discounted. The impact will only be clear from activity data from July. And it could be significant given China’s inability to retaliate on the same scale as the US’s imposition. We think a growth forecast downgrade cycle for China, and the rest of Asia may be just around the corner. Now the US is aiming for tariffs of up to US$200bn of imports from China, whereas China imports much less than that amount from the US. As such, qualitative barriers supplementing quantitative restrictions from the Chinese side should be crowding the financial headlines in coming days and weeks. Here is what our Greater China economist Iris Pang thinks about qualitative retaliation. 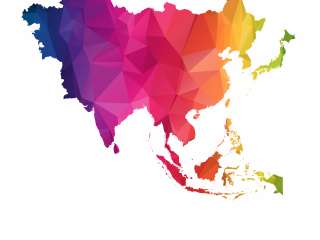 A slew of the June trade releases from Indonesia, Singapore, Thailand, and India will also be examined in light of the trade war. Surprisingly, after a strong run in the last year the year-on-year export growth is still holding firm, still in double-digits for some countries like Singapore. But the base effect is becoming more punishing for others. Korea and Philippines have already started posting negative export growth and, based on our forecast, Indonesia will be the next to join this camp. Underlying our 17% YoY growth forecast for Singapore non-oil domestic exports is almost flat month-on-month growth after a chunky 13% MoM bounce in May. But this will also need steady electronics exports, and the slowdown in electronics exports from Korea and Taiwan in June isn’t a good news for Singapore. 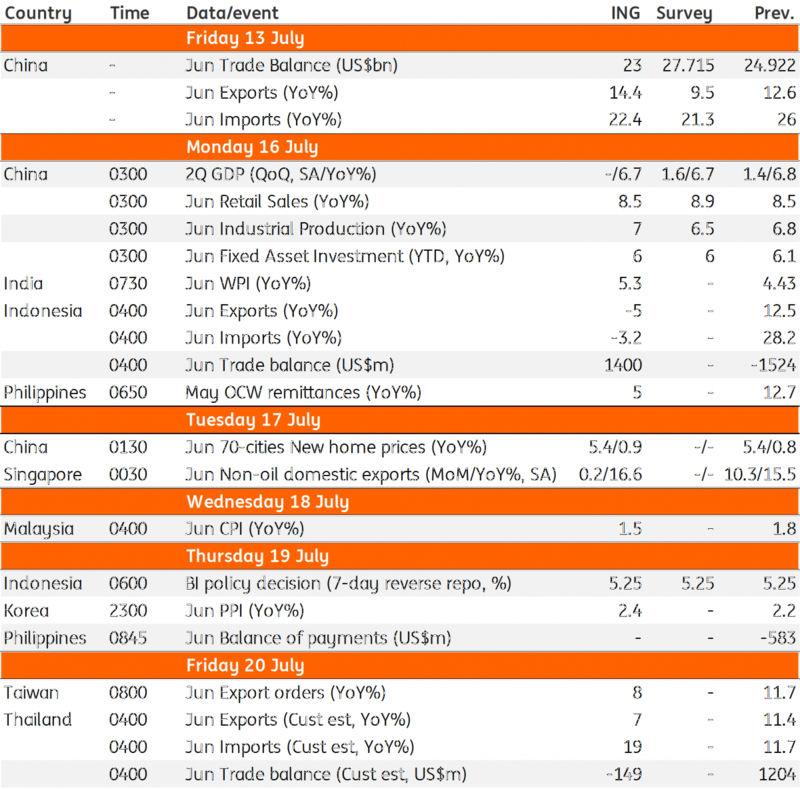 Indonesia’s central bank (BI) will be in the spotlight for the policy meeting next Thursday (19 July). BI’s interest rate weapon for currency stability may have run out of the steam after a cumulative 100bp policy interest rate hike since mid-May failed to curb the IDR weakness. We aren’t expecting BI to use this weapon further, at least not in the forthcoming meeting. There are domestic factors, like wider current account deficit, responsible for the currency weakness. But there is also the global currency contagion from restrictive trade policies and the strong US dollar. Judging by accelerated depletion of Indonesia’s foreign reserves in recent months, exchange market intervention appears to be at disposal to stave off the IDR depreciation. This is further reflected in the USD/IDR rate meeting a strong resistance at 14,400 since late-June, possibly the BI line in the sand for the pair that’s being protected. We remain sceptical of the policy success with our end-2018 forecast of 14,850.